There are two types of people in the world. Those who love to camp and those who’d rather walk down Star Street in their underwear than spend even 24 hours in the elements. I’m here to convince you that if you’re in the latter group, it’s time to let go of your fear of death-by-black-bear and embrace your inner Bear Grylls. Your internal clock will thank you for it. I’ve seen shooting stars in Colorado’s Rocky Mountain range past midnight; I’ve woken up on New Year’s Day to waves crashing 20 feet from my tent on Tai Long Wan, my favorite rural beach in Hong Kong; I’ve been scared out of my mind at 3am on Sunset Peak, shrouded in dense fog, with an imagination that swore footsteps were approaching; my grandparents used to take my brother and me to Possum Kingdom, a lake outside of Dallas, Texas, where we’d spend nights under the stars and days with our feet hanging off fishing docks. I’ve cooked over campfires, told ghost stories, been uncomfortable, covered in big bites and shower-less; and I’m convinced that there’s no better medicine than the wilderness. Camping has so many intangible benefits. But, there’s also a great deal of evidence to support its very tangible benefits, especially when it comes to our over-stressed lifestyles. Notably, improved sleep quality due to a reset of your circadian rhythms is a big reason to hit the trails, pitch a tent, and spend some uninterrupted time in the great outdoors. Electric light, thanks to Thomas Edison, is one of humanity’s most significant inventions. However, humans evolved in a natural light-dark cycle and light technology (from the humble incandescent bulb to the blue light emitted from our smart phones) has proved to be disruptive to our biochemical rhythms. Because of these technological advances and more time spent indoors, we are exposed to less natural light during the day, more artificial light after the sun goes down, and therefore disrupted circadian rhythms. When our circadian rhythms are disrupted, the hormone melatonin is likely not being produced in a natural way, and the lack of adequate timing and amounts of endogenous (naturally produced, versus supplemental) melatonin can have negative consequences across your health landscape. Often just associated with sleep, melatonin is a potent antioxidant with the ability to aid in cardiovascular health, diabetes prevention and even cancer prevention and treatment. A study conducted by scientists at the University of Colorado at Boulder showed just how impactful a week of camping could be in terms of a physiological reset: 6 men and 2 women were monitored during a typical work week (where exposure to artificial light was substantial); and then were assessed again after spending a week camping in the Rocky Mountains of Colorado where their light sources consisted only of natural sunlight (which happened to be 4 times more intense than what they’d experience via artificial light indoors) and campfires. Melatonin levels at onset (when the body begins its production), midpoint (peak) and offset (tapering down) were much healthier and robust after one week of camping. If your goal with camping is only to improve sleep, then you could argue that simply avoiding artificial light and getting natural sun exposure could achieve similar results (both good ideas). However, spending dedicated time outdoors carries other values. 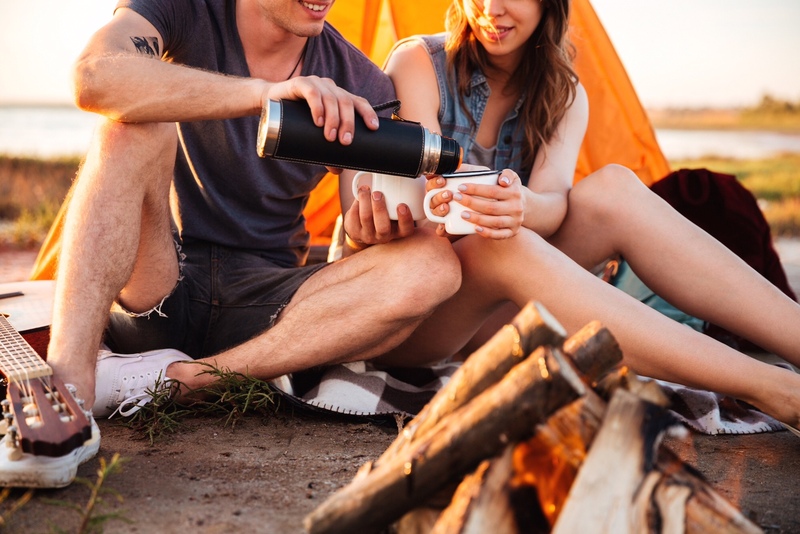 Camping, by its nature, means its more likely that you’ll experience the benefits of earthing (or grounding). For a detailed review of the value of earthing, check out this previous post, Earthing ◆ The Benefits of Going Barefoot, on The Wildery. While you’re camping under the stars, take a moment to breathe deeply and reap the benefits of Shinrin-Yoku, or Forest Bathing. For a full review, check out Forest Bathing ◆ 5 Science-Backed Benefits of Soaking in Nature.